Custom designed for your precious Samsung Gear S3 Frontier / Classic Smart Watch, this V-Moro Solid Metal Watch Band features a combination of functionality and style. 1.High quality, Perfect service while lower price.They are very well built and made of the finest grade of materials and will look the most appealing on most wrists. 2. V-Moro is committed to 100% satisfaction of our customers. 3.We offer the best solution for any issue of product you bought from V-Moro So no matter any problem,pls feel free to contact with us,we'd like to make you have a perfect purchase experience in our shop! This stainless steel watch bands is the perfect choice for those who want to give their Samsung Gear S3 Frontier / Classic smartwatches a different perspective and make them stand out from the crowd. Great for outdoor sports / business / parties / shopping ,ect. They are sure to have people being attracted to your wrists with their smart looks. Girls, boys, kids, teens, and adults alike. No age limited, just limited for your wrist! LIFETIME WARRANTY - This product is sold exclusively by V-Moro. The Other seller who follow us all is FACK product.They are Without Lifetime Warranty and Quality Guarantee. Only buy from V-Moro to get genuine V-Moro products with lifetime warranty and life-time friendly customer service. TOP QUALITY STAINLESS STEEL MATERIAL - Matte metal surface and premium solid stainless steel watch strap fits your Gear S3 Frontier /Classic watch perfectly. Gear S3 Frontier / Classic Band Size: Fit 4.92"-8.50"(125mm-215mm) wrist. The size can be adjusted according to the circumstance of individual wrist. 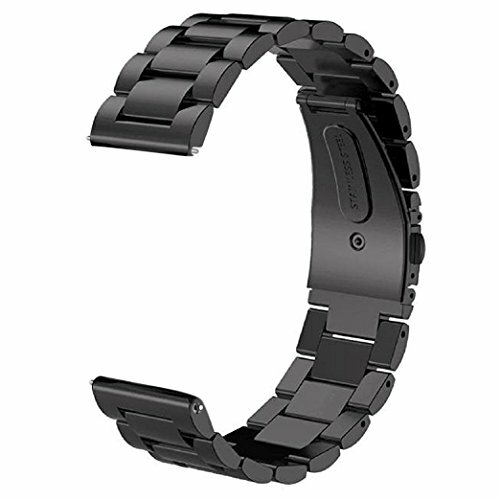 Comes with a handy link removal tool that makes this band very easy to adjust the fit. Package Contents: 1 V-Moro Gear S3 Frontier / Classic Steel watch band+ 3 Pins+1 Remove tools. If you have any questions about this product by V_moro, contact us by completing and submitting the form below. If you are looking for a specif part number, please include it with your message.